At 14:00 GMT ECB President Draghi is to deliver the opening address to the European Parliament, in what could be one of the most important economic stimuli to emerge from the eurozone today. Last Thursday, European Central Bank President Mario Draghi declared that economic growth in the euro area would be weaker than previously expected. During the last meeting, the ECB left interest rates unchanged. Nonetheless, interest rate decisions are precisely those issues that are holding back investors. So the question remains whether the ECB will stay at low rates despite the expected economic slowdown or raise rates later in the year. Draghi named reasons to leave interest rates unchanged; identifying the strength of the labour market in the eurozone and, in particular, rising wage growth as an important factor in this regard. These factors would help to boost inflation in the medium term. Furthermore, Draghi continues to identify Brexit and China as key uncertainty factors, which could negatively affect the economy. As a result, investors’ attention today may remain trained on Draghi’s comments to ascertain whether his speech on Thursday will prove more generous on the specifics. The Chart Technical View. On Thursday, the EUR/USD showed the second largest one-day decline in January. With its daily closing price at 1.130, the market moved out of the lower boundary of the triangle. However, this breakout was not confirmed last week’s trading day. The support area stood firm, and the market moved back to its triangle. For now, the focus is on the MACD. If the MACD turns and crosses its trigger line, the chances of reaching the upper border of the triangle improve. If this does not pose a problem for the market, at that point the next price target could be at the upper limit of the channel. If the market also breaks through this barrier unscathed, then the high at 1,750 could be the next target. 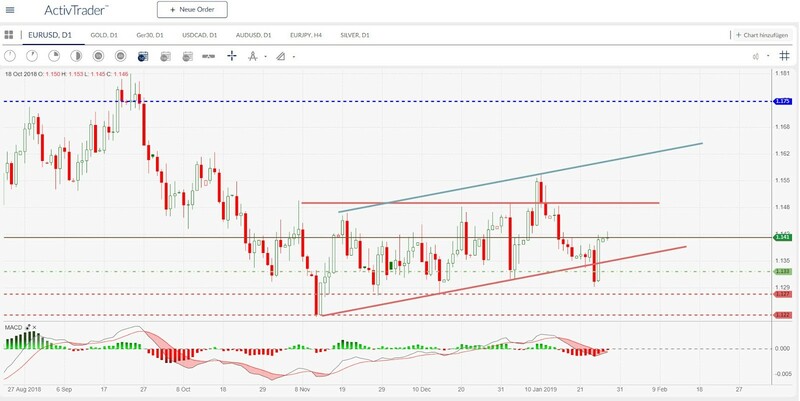 Should the movement back into the triangle prove to be a false breakout, and the bears take over again, then the market could find support at 1.1270 and 1.222, respectively.